As soon as you slip on Qualcomm's Snapdragon 835 VR Developer Kit (VRDK) headset, you'll notice two things. For one, there are no wires, nothing that tethers you to a high-end PC or mobile device. You can move freely around a room (careful not to run into a TV though, as we almost did). The second thing you notice: you can see your hands. Well, they're not your hands, but rather animations that stand in for those five-fingered lumps at the end of your arms. We've seen something like this before in the form of Manus VR, but in that case, we were wearing full gloves with VR tracking devices lashed on. The effect then was great – for the first time, we felt truly immersed in a virtual world because we could use our physical hands to interact with digital objects by way of their digital avatars. But in the case of the Snapdragon 835 VRDK, gloves, controllers or other manual inputs aren't required. That's because the headset is equipped with cameras that tap into tracking technology from Leap Motion, a pioneer in the space. These sensors allow your real-life hands and fingers to make the jump into the digital world, gestures and all, using nothing more than the Snapdragon 835 VRDK headset on your face. We got to try Qualcomm's creation out for ourselves this week at GDC 2017. It was an enjoyable, nearly flawless look at what VR can be. Too bad it will be up to companies other than Qualcomm to make it happen. You see, the Snapdragon 835 VRDK isn't a consumer device. It is a developer kit that will ship to app makers in Q2 2017, so they can begin creating content that will run on devices housing Qualcomm's latest Snapdragon mobile processor. As Tim Leland, Vice President of Product Management at Qualcomm, told us at the show, the chip giant heard from developers that they wanted to see what the new silicon can do without having to wait for fully commercialized products to hit the market, which won't happen until at least later this year. The answer to their calls is Qualcomm's newest VRDK. The headset's design is 100% Qualcomm's, Leland says, and even though it's not shipping to consumers, the Snapdragon 835 VRDK does serve as a reference design for Qualcomm's newly announced Head Mounted Display (HMD) Accelerator Program. This will allow hardware makers to use it as a starting point for their own head-mounted displays that utilize the processor, meaning we could eventually see headsets similar to the Snapdragon 835 VRDK up for sale. Qualcomm used two demos to show off the effectiveness of its new chip and the headset's Leap Motion hand tracking. The first was a mini game in which we were in a space-type setting surrounded by geometric blocks. We could "pick up" blocks strewn on the ground and play around with them because the headset could translate our real-life hand motions into virtual actions. A pinching motion also allowed us to conjure a block in front of us, and by extending our pinched fingers away from each other, we could stretch the block to a larger size, or bring our fingers together for the reverse effect. Holding up our left hand turned it into a sort-of control pad; by pressing one of three buttons that appeared next to our fingers, we could change the shape of the blocks we wove out of thin air. We could set the blocks down where we liked, throw them across the expanse, or stack different shapes on top of each other. At one point, at the behest of a Leap Motion representative, we even made a catapult that launched a small prismatic block across the room. During the minutes-long demo, there was only the slightest lag between what we were doing with our real hands and what took place in the virtual world. We say it was a slight lag, but at points it was imperceptible because the hand renderings responded so well. The graphics were well-defined and smooth on the 2,560 x 1,400 display, and the myriad pigments of the space world's sky - yellows, pinks, deep blues and purples studded with bright stars - were artfully blended. Coupled with the soothing music coming through the headphones (not included with the headset), the experience was soothing, almost meditative. It wasn't perfect, however. There were times when our hands seemed to move too fast for the cameras and rendering engine, and we'd miss picking up a block. We'd have to repeatedly grasp at it or try to throw it a few times when this happened. The lag wasn't to the point of frustration, and the virtual hands recovered quickly, but these moments were a reminder we didn't really have our hands in this VR world. Another feature that was noticeably absent is haptic feedback. Whereas the Oculus Touch controllers vibrate when you interact with an object, there's no such feature for the Snapdragon 835 VRDK. We understand that's not the point of the device – it's a vessel for application development, not end-user enjoyment – but it notches a point in favor of VR gloves and controllers that can provide physical sensation as well as control input. Because the headset lacks of tethers, you could conceivably throw it in a bag and use it any time, anywhere. It's also an all-in-one device, so you don't need a smartphone to serve as the display and power guts, as you do with headsets like the Samsung Gear VR and Google Daydream View. As Qualcomm puts it, this is the type of take-it-with-you headset you think of when you think of VR. While not as sleek in looks as the Oculus Rift or HTC Vive, we found the Snapdragon 835 VRDK to be a comfortable fit. It was lightweight, almost teetering to the point of feeling too unsubstantial, and there was only the slightest sensation that most of its weight is in the front. This was nowhere near the point of neck-straining discomfort, however. The display was crisp and without the annoying screen-door effect of smartphone-driven HMDs. It was the distinct lack of being able to pick out individual pixels, at least in the block game, that was immediately noticeable. According to the Leap Motion representative who conducted our demo, the headset gets about two and a half hours of battery life, a respectable life span when you consider how quickly phone power can be chewed up on mobile VR headsets. The Snapdragon 835 VRDK features foveated rendering, a feature Qualcomm is keen on because it allows developers to maintain the artistic integrity of their creations while reducing power consumption. Foveated rendering essentially delivers only the highest resolution to the area where you're looking, and everything else is at a lower resolution. While it was hard to get an exact sense of this while wearing the headset, it did seem as though whatever we were looking at was the sharpest, while stuff on our peripheral was blurred. There was no noticeable lag of the resolution amping back up when we moved our eyes to look at something else. The VRDK also boasts six degrees of freedom motion tracking and spatial audio to shore up immersiveness. The block game wasn't intensive enough to push the Snapdragon 835 to its processing limits, and the second demo, a Power Rangers reel, was well rendered, but not quite as crisp. It was much more involved than the block game and featured actual characters and machines performing various actions, and while it was bursting with colors and detail, there were notable moments of lag and blurriness. As one Qualcomm representative readily admitted, the Power Rangers demo was more "swimmy" than the block game. Our hands weren't in this demo reel either; using your hands in a more intensive Power Rangers or other game may prove a little too much for the headset to handle, but again, we couldn't tell based on this demo. With 4GB of RAM and 64GB of internal storage, the Snapdragon 835 VRDK should be just enough for developers to create content intended for mobile VR and tetherless HMD devices. This isn't, remember, a headset designed to hook up to high-end PCs. 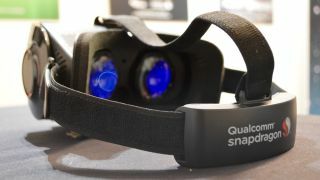 Despite its faults and power and storage limitations, the Qualcomm Snapdragon 835 VRDK feels like a capable headset that would serve as an easy entry point into virtual reality for the average consumer. The experience was enjoyable and without the burden of wires and controllers. Funnily enough, we're so trained to headsets that are attached to a stationary object, we weren't all that comfortable moving around. That, and the fact we almost ran into a television set, didn't inspire us to wander too far. As was promised, the VRDK feels like a headset we could take with us anywhere and pull out when the mood to enter a virtual world struck us. There's no complicated set up or need to sacrifice a phone to run an experience, which could be the perfect formula if you need a quick escape from reality. The most delightful part, of course, was using our hands. As the Leap Motion representative told us, there isn't anything available right now that lets you bring your hands into VR without using gloves or controllers. While haptic feedback was missing, it didn't feel necessary to have, though perhaps after longer use, we'd pine for it. Alas, the Snapdragon 835 VRDK is not a device anyone but developers can buy. Qualcomm hasn't announced a price for it either, which could be another limiting factor if it's above a certain price point. What is exciting about the headset is that it will influence hundreds of virtual reality experiences destined for devices like the Google Daydream View, Google Cardboard, Samsung Gear VR and other HMDs that aren't announced yet but will utilize the Snapdragon 835 processor. From what we've seen of the Snapdragon 835 VRDK's capabilities, there's much to look forward to on the VR horizon, and it's almost within our grasp.